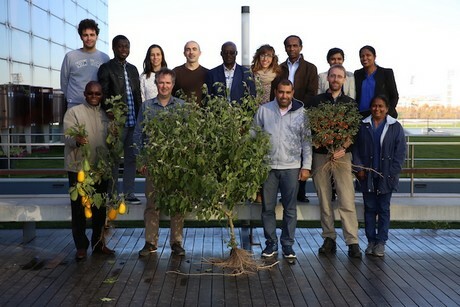 Late November, I had the great pleasure to attend the final meeting of the eggplant project: “Utilization of crop wild relatives in eggplant pre-breeding for adaptation to climate change”. This is one of the 19 pre-breeding projects working across the globe under the Crop Wild Relatives Initiative. Three complementary teams worked closely together. 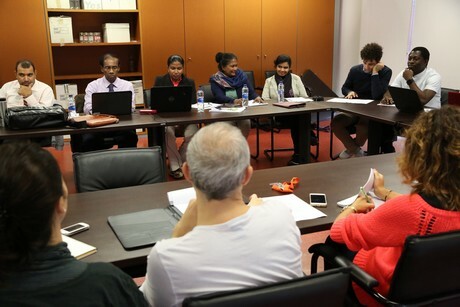 The scientists came from three universities: the Universitat Politècnica de València (Spain), the University of Peradeniya (Sri Lanka) and the Université Félix Houphouet-Boigny (Ivory Coast). Professor Jaime Prohens from València coordinated the team. Accompanying them was a representative of the World Vegetable Center in Taiwan. This meeting took place at the Instituto de Conservación y Mejora de la Agrodiversidad Valenciana, Universitat Politècnica de València. 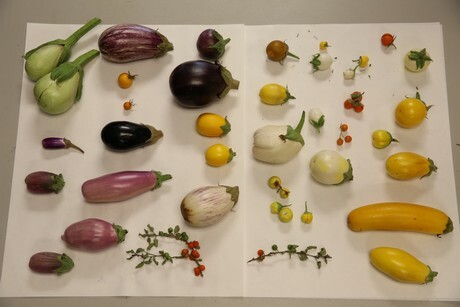 The main objective of the project was to develop eggplant pre-breeding materials carrying introgressions (small parts of the genome) from wild relatives of eggplant, providing the foundation for eggplant cultivars of the future. I joined the Crop Trust in July 2016, and this was my first “last” meeting of a project funded by the Crop Trust. So naturally, I was curious to meet the project partners face-to-face and excited to learn more about what the team had really achieved. Of course project outcomes can be obtained from technical reports, but for me it’s always key to meet the dedicated people behind the work. The meeting kicked-off with a series of presentations highlighting the objectives, the achievements made and the lessons learned during the three-year project. We then visited the experimental fields, greenhouses and climatic chambers. Of course all this was interesting, but I had seen many similar facilities in the past already. What was new for me, and so fascinating, was the diversity of the eggplants! From purple to white to yellow, of all different shapes and sizes, the cultivars, and even more fascinating, the wild relatives being used in the crossings were truly incredible. As occurs with many domesticates, eggplant has a narrow genetic base as a result of several genetic bottlenecks during domestication and crop evolution. However, wild relatives have a large genetic diversity that can be incorporated into the genetic background of eggplant. I was also deeply impressed by the enthusiasm of the whole team. The number and quality of the eggplant material produced is overwhelming, and the quality of science is very good. Overall, hybrids and backcross lines have been obtained with 15 different crop wild relatives representing a huge amount of materials that will hopefully be beneficial for the next generation of eggplants. Beyond the sheer number of several thousand crosses, it was impressive to see how challenging this work was for the team – with crosses over species boundaries or even crosses between species belonging to different “genepools,” meaning they are quite distinct from an evolutionary point of view. This kind of work is challenging, labor intensive and requires serious expertise and skills. You also need the right plant materials, meaning healthy and ready plants, that have good pollen, where the stigma is ready to accept the pollen and more. Working with eggplant, there are several crossing barriers, which usually prevent interspecific hybridizations. What’s more, several further parameters can’t be controlled. For example, some crosses only work in the early morning on sunny days, others only during long summer days. So, the environment also plays a critical role, and at the end, you really just need some luck. Given the long-term nature of the introgression work, and the many challenges stated above, among other considerations, private breeding companies usually do not invest in such “pre-breeding” projects. Thus, we are so grateful for the support from Norway, who funds the CWR initiative and allows efforts like this one to push forward the development of materials that will play a role in adapting our agriculture to present and future challenges. This project has generated a huge amount of diverse materials (hybrids, introgression lines, recombinant inbred lines and more). It has also, as expected, successfully inserted loads of genetic diversity into cultivated eggplants. And, perhaps what is most important and unique of all, is that the project partners used cultivars from Ivory Coast and Sri Lanka as elite parents. These are among the major eggplant producing countries in the developing world, which might suffer from climate change. Beside the generation of tons of promising materials, the capacity building component of the project was incredibly strong and by far exceeded my expectations. Jaime and his team generously invited and trained many more students from Ivory Coast and Sri Lanka than previously agreed on. The students learned how to make the crosses, developed new protocols, and learned how to use molecular markers in the lab to identify introgressed fragments of wild relatives. Dissemination is also an important parameter everybody asks for at the end of a project. Well, I must say that the dissemination part of this eggplant project is simply stunning. The team produced all kinds of publications, presented their work at scientific congresses and reached out to their stakeholders in various ways. Please take a look at the project page for more details. The plethora of pre-bred materials generated in this project will be the starting point for a new generation of eggplant cultivars. And the best thing that comes out of this effort is that all plant materials generated within this project will be shared with breeders everywhere. This is where the World Vegetable Center will play an important role. It is the World Vegetable Center who will safeguard and make all of this material available under the terms of the Standard Material Transfer Agreement (SMTA) within the framework of the multi-lateral system, as established under the International Treaty for Plant Genetic Resources for Food and Agriculture (ITPGRFA). This project was a great success story. Now, we are extremely excited to announce that the World Vegetable Center has agreed to coordinate the follow-up project (2017-2019). Mohamed Rakha and Jaime Prohens will be supervising the activities. All former project partners will be on board, as well as five breeding companies. To characterize/evaluate the lines for the traits of interest (e.g. disease resistance, drought stress, heat stress). 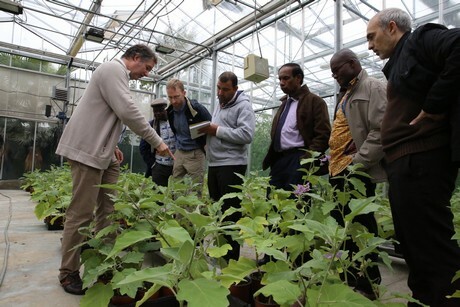 Then, World Vegetable Center and five breeding companies from Africa, Asia and Europe will select the most promising lines for their breeding programs. The team envisions using the wild eggplants as so-called rootstocks – to graft on top of the cultivars. This will make the cultivars resistant to many diseases. The end-of-project meeting reviewed the achievements made during the project and how to exploit the pre-breeding materials and information generated in order to obtain a new generation of eggplant cultivars more adapted to the stresses caused by climate change. Under the CWR initiative, pre-breeding projects across the world are developing materials that will hopefully help in transforming our current domesticated crop varieties into more resilient ones. Just imagine, a small introgression from a wild relative of eggplant introgressed in a commercial cultivar could make a world of difference in our future. In a couple of years, we might be announcing a new generation of eggplants! 2017-09-28 "Plant breeding innovation at the heart of a sustainable EU agri-food policy"
2017-09-26 Will Europe embrace precise plant breeding or further frustrate innovation? 2017-09-25 "Agriculture will win the CRISPR race"
2017-09-19 What does the future of peppers look like?